For readers who made David Allen’s Getting Things Done a perennial bestseller, a fresh and entertaining exploration of a topic that concerns just about everyone over the course of their careers: how to be more productive at work, and in every facet of our lives. After earning his business degree, Chris Bailey turned down several lucrative job offers to pursue a lifelong dream—to spend a year performing a deep dive experiment into the subject of productivity. Bailey had been fascinated with productivity since he was a young teenager, when he began researching every paper and every book available on the topic. After graduating college, he created a blog to chronicle his year long series of productivity experiments on himself, and well as his continuing research and interviews with some of the world’s foremost experts, from Charles Duhigg to David Allen. Among the experiments that he attempted: Bailey went several weeks with getting by on little to no sleep; he cut out caffeine and sugar; he lived in total isolation for 10 days; he stretched his work week to 90 hours; a late riser, he got up at 5:30 every morning for a month, all the while monitoring the impact of his experiments on the quality and quantity of his work. 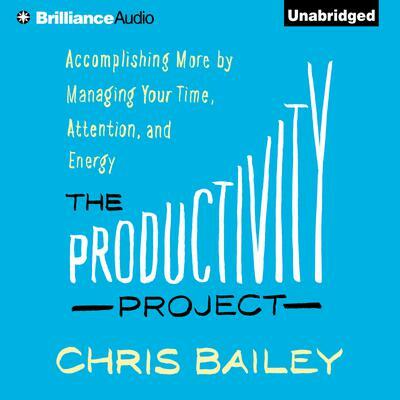 This book—The Productivity Project—and the lessons Chris learned—are the result of that year-long journey. Among the many counterintuitive insights Chris discovered that had the biggest impact on his productivity: shrinking or eliminating the unimportant; the rule of three; striving for imperfection; scheduling less time for important tasks; the 20 second rule to distract yourself from distractions; and the concept of productive procrastination. Bailey offers over 30 best practices that will help every one of us to accomplish more.